What is the depth of the canal and docks? Where was the spoil deposited? How was the canal made watertight? Why was the canal built with a double bend two miles south of Gloucester? How far is Gloucester from the sea? Why does Llanthony Bridge have a Welsh name? Why did the commercial use of Gloucester Docks decline? Why does the water in the Main Basin look dirty? How much do new apartments cost? Do boat owners have to pay to have the bridges opened? The canal and the Main Basin at Gloucester were originally dug to a depth of 18ft, and the water level was later raised six inches to allow larger ships to reach Gloucester. 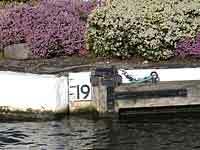 The water level gauges therefore usually show a level of 18ft 6in. The New Dock at Sharpness was dug to a depth of 24ft to suit the much larger ships that this dock was intended for. Naturally accumulating silt tends to reduce the depth and has to be removed by dredging. As flat-bottomed steamers replaced deep-keeled sailing ships, the canal and Basin at Gloucester were only dredged to a depth of 16ft, and now that commercial traffic on the canal has ceased, the accumulation of silt is allowed to reduce the depth even more. When the Main Basin at Gloucester was dug out, the spoil was used to build up the level of the surrounding land, which had formerly been meadows sloping down to the River Severn. The spoil from digging the canal was piled up on either side of the excavation, where much of it can still be seen today, although some material from the cuttings was boated to help build up the embankments over low-lying ground. Along most of the route, the underlying strata is clay or some other impermeable rock, and the side embankments were built with a central core of puddle clay. Gloucester is 35 miles from the mouth of the Bristol Avon, where the Severn Estuary is five miles across, and Gloucester is 55 miles from Cardiff and Weston-super-Mare, where the Severn Estuary widens into the Bristol Channel. Llanthony Bridge is named after the priory of Llanthony Secunda, of which some remains survive to the south-west of the bridge. The priory was founded in the 12th century as an offshoot of Llanthony Prima in the Honddu valley, north of Abergavenny, Monmouthshire. Gloucester docks developed to accommodate the discharge of cargoes from ships. Since the canal from Sharpness was built, the size of ships used in international trade has increased substantially, and it became increasingly uneconomic to operate ships small enough to come up the canal to Gloucester. This led to the general transfer of trade to ports that could handle larger ships, and regular ship movements to Gloucester died out in the 1980s. The water level in the canal is maintained by pumps under the West Quay that draw water from the River Severn, and this carries a high level of silt in suspension. Much pumping is required, not only to make "../vessels/dredgers.htm"operated but also to feed an extraction and purificat"../vessels/dredgers.htm" which supplies drinking water to Bristol. In Oct 2004, advertised prices for one-bedroom apartments were around £150,000 and for two-bedroom apartments around £180,000. Boat owners pay a licence fee, related to the size of their boat, and they do not have to pay any extra to pass through the bridges and locks on the Gloucester & Sharpness Canal.